Creamy mustard salad dressing is simply decadent with the addition of hard-cooked eggs. I like to serve this dressing over Romaine Lettuce. and it is also be great on a spinach salad. Making your own salad dressing is much easier than you might think. It is nice to be able to control what goes in your dressing and adjust for your dietary needs. Try using a sugar substitute or sour cream for a healthier version of this delicious salad dressing. Another family-favorite Honey Mustard Dressing and more delicious Salad and Salad Dressing Recipes. * Learn how to Boil Perfect Eggs. ** I have also substituted sour cream. 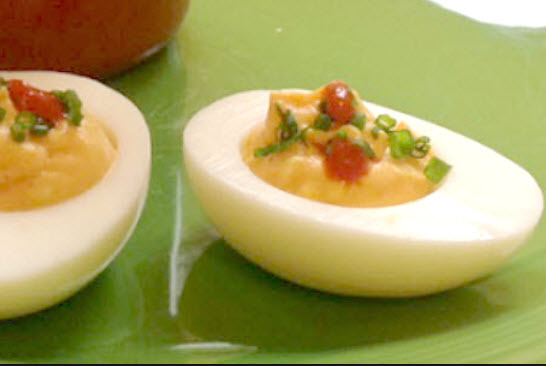 In a large bowl, mash the hard boiled eggs as small as you can. Then adding one (1) ingredient at a time and in the order listed, stir in the salt, sugar, pepper, garlic, olive oil, Dijon mustard, cream, and vinegar. When blended, whisk until emulsified. Store, covered in the refrigerator. Whisk before serving. Source: I adapted this delicious Creamy Mustard Dressing from the Oregonian FOODay, Tuesday, May 3, 2011.